I hate packing, so it’s no surprise that in between last minute cleaning / chucking things to clean / pack I ended up in front of the computer. I did manage to find a really cool ljgroup with a big list of fandom related knits. 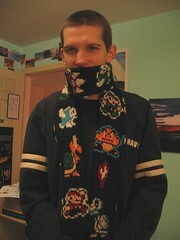 It doesn’t beat craftster in terms of sheer craftiness, but it’s a pretty good place for a list of concentrated knit fan stuff like the uber cool Mario scarf. There is another version that only has the villains, but I can’t for the life of me remember where I saw it. In any case, I have found my next project: a R2D2 beanie (might tweak it a little since the shape doesn’t look right). Y, if you’re reading this I’ll wear this if you wear your Princess Leah hat! Insane? nah, different well yes :P. I think the shape needs to be a little rounder for it to look like R2D2, faux glassy looking things would probably add to it as well.